2019 Advance Weekend Passes Are On-Sale! 2019 Early Bird tickets are now gone! Thank you to everyone who has bought ahead of time. 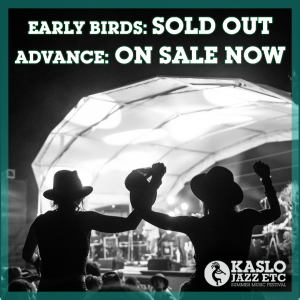 If you would like to secure your spot at this year’s festival while still saving, ADVANCE Weekend Passes are now ON-SALE at kaslojazzfest.com. Still time to buy ahead and save! Sign up to the Kaslo Jazz Etc. Newsletter for all the latest info and updates! 2019 Board Of Directors 2019 Initial Artist Announcement!